For years, we’ve been telling people about a straightforward way to change conveyor belts. In this week’s blog post, we’ll talk about that solution: the hinged lace belt. But first, we should address some of the time-consuming, inefficient methods of belt changing. Removing a table from its a jack screws, taking out the drive motor assembly and then re-aligning and leveling everything can be a nightmare…and that’s one of the easier scenarios. Some machines you’ll literally need to split in half to install an endless belt, a process that can take days. Over the years, conveyor belt manufacturers have come up with different ways to make couplings. One of the more popular was the metal clipper lacing – sometimes called the “alligator clip” – that involved pressing a strip of U-shaped steel into each end of the conveyor material, and then sliding a pin through the clips to hold the ends together. It was quick and easy, but came with its share of problems. The first thing people would notice when finishing a piece of material was an inconsistency on a part when it bridged this section of the belt. Belt ware was limited because once you started hitting the conveyor with the abrasive belt, it would cut into the metal clips, effectively turning them into a razor and – in some cases – destroy the contact drum. Then, about 15 years ago, we met a young salesman who had a solution to this problem: the hinged lace conveyor belt. 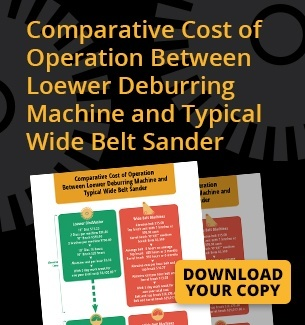 The design on the belt eliminates the excessive downtime associated with belt replacement. And it eliminates the need for conventional metal clipper lacing, which is known for its dead zone and dangerous metal hooks. We’ve been providing these belts for many years, and have yet to see a failure. It takes about an hour to install, and once it’s on the machine it will be almost impossible to spot the seam. Contact AM Machinery to learn more about how we can provide a simple solution for your conveyor belt replacement problems.